Yes, you saw it in the title. A yummy chocolate cake recipe that only calls for 4 ingredients, well... 5 if you count baking powder, but... oh well! Let's get over with the 4 simple (or 5) ingredients to get this rolling. As you can see, chocolate makes up a large portion of the recipe, hence it's is very important that you choose a good quality chocolate. 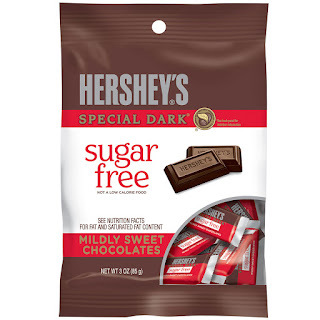 I used Hershey's, although some may not feel that Hershey's is a "good enough" brand of chocolate, but it'll do for me. And so, first up, break up your chocolates (if you're using bars) into tiny pieces and melt them over a pot of simmering water over the hob, constantly stirring until they're smooth and glossy. Be sure that your simmering water does not touch the bottom of your chocolate bowl, or you might burn your chocolates. Then, add cornstarch to your skimmed milk and mix until the mixture thicken, before adding it into your melted chocolate and stirring until it's well combined. Add in the two beaten eggs and mix until well combined before sifting in your dry ingredients and mix till combined. Pour your mixture into a 18x8cm long cake pan (to get a taller cake) or a 26x6.5cm pan (to get a flatter, more brownie-looking cake) and give it a few taps on your counter for any bubbles to rise. Send your pan into the oven, heated to 170 degree Celsius for 20 to 25 minutes. Now, here's the important thing. If you're looking for a more fudgey, moist and gateau chocolate cake like consistency, you actually may omit the baking powder and bake your cake for only 20 minutes. There's no need to do the toothpick test to check if your cake is 'done' because your toothpick will not come out clean. However, if you prefer a more cakey and dry consistency like me, bake your cake for up to 25 minutes (also depends on your oven and its settings) until it's fully baked through. Taste wise, it's extremely rich and chocolate like a brownie, but without the usual dense and heavy texture of a usual brownie. 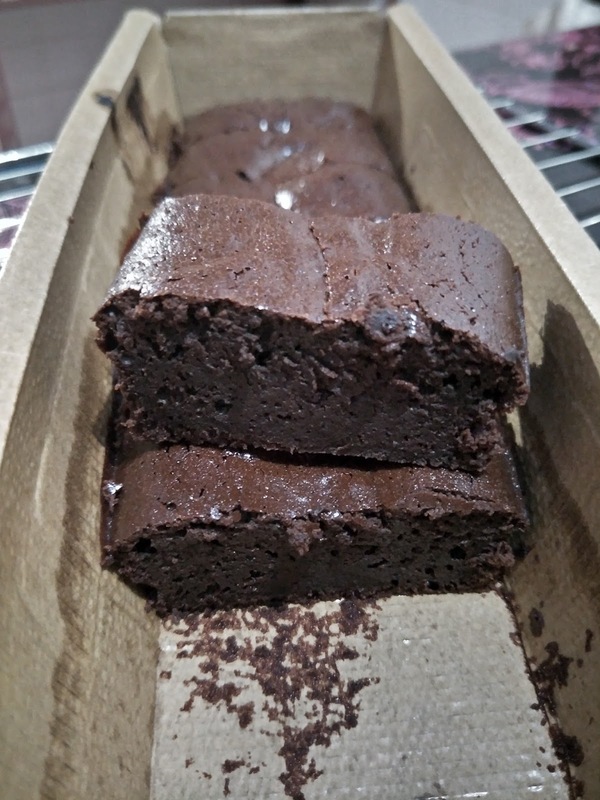 As you can see, this recipe omitted the usual butter found in most brownie recipe, hence cutting your calories by... abit. Well, there's still tons of chocolate so you can't expect this to be a low-calorie treat. Hence, estimated calories per 1 of 8 servings is about 144 kcals, which definitely is not your most diet-friendly snack, but still not that bad for a #cheatdayeat treat, yes? This is a good idea for mom's who are in a tight budget but still want to give their kids some treats. I can also tell that this is easy to make. Not to mention, time-efficient too! I just hope that if I were to make this, I won't fail. It sounds delicious as well.